These orchids are prized for their sprays of large flowers, used especially as cut flowers or for corsages in the spring. There are two main types of cymbidiums, standard and miniatures. The miniatures are recommended for warm areas and indoor home culture. The standard varieties need cool growing conditions, such as a cool greenhouse or sun porch with winter night temperatures in the fifty (50) degree range. Cymbidiums are high light orchids that must be protected from direct noon day sun with a 20% shade cover. They are best located outdoors in the summer months with filtered sunlight. When the night temperatures fall into the forty (40) degree range they should be relocated to a cool indoor growing area with day temperatures about 60F to 65F degrees and the night temperatures as low as 45F to 50F. If you are growing your cymbidium plant outdoors in the hydroculture system you will need to drill a side wall hole in the outer pot about one inch up from the bottom. This hole will create the overflow drainage in case of a heavy rain. When you relocate the plant to its winter indoor location you may plug the hole with silicone. Miniature cymbidium orchids grow very well indoors with about four (4) to six (6) hours of sun a day. The ideal location is a south to southeast facing window. 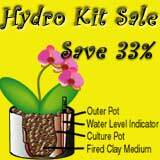 Growing your orchid in a hydroponic planter takes all the guess work out of when to water and how much. Water only when there is no water left in the outside pot. It is all right to leave your orchid dry for a day before watering. Mix the nutrient solution as per packet directions. You may store the nutrient in a gallon plastic bottle to be used whenever it is time to water your plant. It is best to keep it at room temperature and out of direct sunlight. Once a month separate the culture pot from the outer pot and run tepid water through the clay pebbles and over the foliage to remove any dust and mineral salts that will accumulate in the root zone. Return the culture pot to the outer pot. Do not water until the follow day to provide maximum oxygen to the root zone.